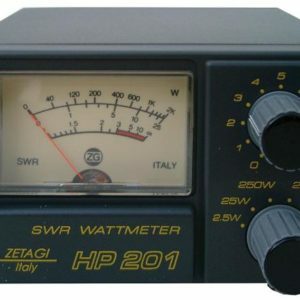 The Diamond SX-200 is a back lit SWR/Wattmeter covering 1.8-200 MHz. The meter reads peak or average power, and is switchable to read forward power, reverse power, or SWR, and has three power ranges: 5, 20 and 200 Watts, full scale. If back lighting is used, a 13.8 vDC source is required. The meter is supplied with a DC power cord.